With Modern UI, you can have access to the main features of JungleDocs for Office 365 without leaving your SharePoint list or library. Here's how to install it. 1. 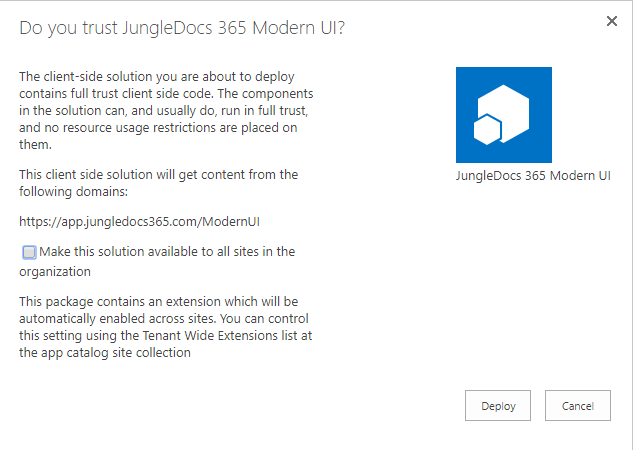 Download and extract JungleDocs Modern UI installation file. 2. Upload the extracted .sppkg file to the App Catalog. Note that you must create the App Catalog before you can upload custom apps to it. 3. In the pop-up dialogue, check the Make this solution available to all sites in the organization box if you want to install the application to all of your sites at once. If you leave this box unchecked, you will need to manually add the application to each site. Note: Modern UI access to a site collection is granted through the main app (JungleDocs for Office 365). It means that Modern UI will only work if it is installed on the same site collection as the main app. Therefore, if you have multiple site collections, we recommend deploying Modern UI app with Make this solution available to all sites in the organization option checked. As a result, once you add the main app to a site collection, Modern UI will be deployed to all sites automatically. 5. Test the application: open any list or library where you are using JungleDocs for Office 365 and look for JungleDocs 365 button in the modern list menu. After clicking on it, a Modern UI sidebar should appear. Note: Modern UI app is only compatible with SharePoint modern experience (i.e., classic view is not supported).